As Bahrain’s parliamentary elections approach amid escalating political repression, Americans for Democracy & Human Rights in Bahrain (ADHRB) will be closely monitoring all updates until the vote on 24 November 2018. This blog series, Election Tracker, will follow developments and provide context on the upcoming elections. In anticipation of the upcoming 24 November parliamentary elections in Bahrain, the kingdom has set up a workshop for civil society institutions planning on monitoring the national elections. It is reported that 231 observers will oversee the elections, and these civil society institutions will be working in conjunction with the High Elections Committee to track any voting violations. Due to Bahrain’s restrictions on civil society, the only operating civil society institutions are closely linked to the Bahraini government. It is concerning that these monitors therefore will not be independent, and will not ensure free and fair elections. The High Elections Committee’s involvement with the Bahraini government additionally means their participation will not be impartial. Included in the participating election monitoring institutions is Bahrain’s National Institution for Human Rights (NIHR). In 2017, the NIHR reported that there were no cases of torture within Bahraini prisons, despite an Amnesty International report stating that there were at least nine incidents of torture against imprisoned government critics in the first six months of 2017. The NIHR routinely whitewashes human rights abuses in Bahrain and should not be responsible for overseeing elections. The United Nation’s (UN) Committee against Torture (CAT) has even called out the NIHR for its lack of independence. Another one of the civil society institutions involved in observing Bahrain’s upcoming parliamentary elections is Bahrain Human Rights Watch Society (BHRWS), a government-organized non-governmental organization (GONGO). BHRWS wrote in a government sponsored paper that members of the opposition who call for a boycott of the elections should be likened to terrorists. This was in response to a tweet supporting boycotting the elections from Ali al-Aswad, former member of the dissolved political society Al-Wefaq, who was exiled in the United Kingdom. The High Elections Committee, another supposed election oversight body, is led by Minister of Justice, Islamic Affairs, and Endowments, Sheikh Khalid bin Ali Al Khalifa, a member of the Bahraini royal family. During his time as Minister, Sheik Khalid has suppressed Bahraini Shia Muslims through the destruction of their mosques and has seen that the Ministry of Justice, Islam is Affairs, and Endowments (MOJ) dissolvedpolitical opposition parties like Al-Wefaq and Wa’ad. Under Sheikh Khalid, the High Elections Committee also supports the gerrymandering that occurs in Bahrain. Legitimate, independent civil society organizations have been eliminated from participating in Bahrain’s public sphere in recent years. Since 2011, the Bahrain Center for Human Rights, the Bahrain Youth Society for Human Rights, and the Bahrain Human Rights Observatory, among others, have all been shut down or forced underground. By not allowing independent organizations to assist in monitoring the upcoming election, the electoral oversight becomes partial under the High Elections Committee and the government-influenced civil society institutions it has chosen to work with. 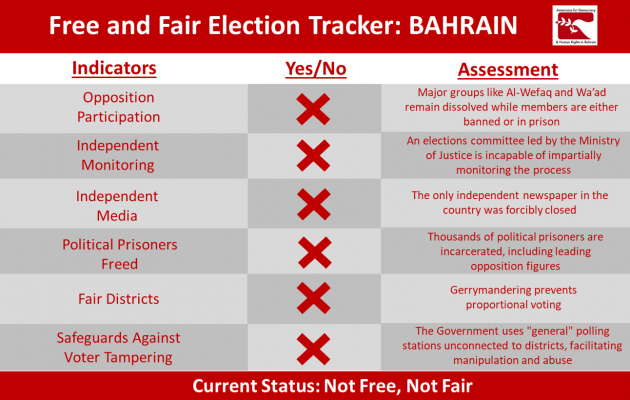 Bahrain’s upcoming elections fail to meet the standards of a democratic election. By eliminating any opposition political societies, gerrymandering voting districts, and monitoring the election with only pro-government organizations, the elections will clearly be neither free nor fair.